There’s no bigger buzz kill at a wedding than an empty dance floor. 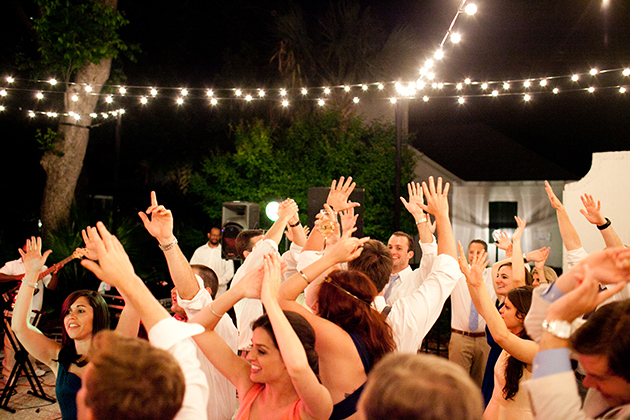 Ideally, you want your guests to be up and on their feet and grooving to the sound of the music all night long. So how do you get the party started and keep it going then (which is the hard part, of course)? We asked a few wedding insiders to break it down for us. “Couples are often worried that their dance floor will be too small, but it’s equally important to make sure that the dance floor isn’t too big,” warns Jaclyn Fisher, owner of Two Little Birds Planning. Otherwise, it’ll look empty no matter how many people you have out there cutting a rug. Wedding Photographer Michelle Girard has definitely seen her fair share of dance parties. According to her, getting people onto the floor is half the battle. “Once your friends and family are already out there though, they’ll likely stay for a few songs. At many Jewish weddings you’ll see this happen with the tradition of the Hora and that energy really compounds,” she notes. Another smart move is to have your DJ invite other couples to join you midway through your first dance, then transition into an upbeat song immediately afterward to keep guests grooving. And don’t forget to blast popular picks from a variety of generations! “Some musicians would rather play songs they prefer, but if you stick to the big hits, you’re guaranteed to get (and keep) your guests on the dance floor,” assures Jerry Wise, co-founder and vocalist of Austin-based national wedding band, the Matchmaker Band. Last but certainly not least, make sure you’re out there and at the center of it all, says Griffin. No one can resist a smiling bride and groom on the dance floor,.